I’m setting this to publish on Friday morn, as I’m off to more adventures. I’m going to see Kevin in Packwood. Hopefully, we’ll have good weather and I can go check on all the wild plants that I’ve been following with photos. I look forward to seeing how Kevin’s veggie garden is going too. Oh, and the hummingbirds. I hope to see some new birds at the feeders with seeds. Saturday morn, we’re taking off for the Portland area to see his mom, Mrs. M. We’ll stay over one night, then head back to Packwood Sunday afternoon. The latest school shooting took place just down the road from his mom’s place. I can only imagine the anger, fear and sadness of that community. I took a lot of photos there this fall and it was one of the places I was going to take Kevin, but we’ll probably do that next trip. Instead, I hope I can find one of the back roads to some vineyards and a great view of Mt. Hood. If we’re not too tired, we’ll probably play a game of pool and listen to some music. I’ll head home Monday, with a stopover in Centralia to see my children, grands and maybe an uncle, aunt or cousin. If there’s things for me to do at my aunt’s, I’ll probably stay the night at Sara’s. Then I’m home for the rest of June, except a trip to Bremerton to consult with an oral surgeon. Since I got some white picket fence from my aunt, the secret garden has been extended, so there is a lot of work to do on that. Greg does most of the structure work and I do the planning and planting. I hope to incorporate a sampling of the wild plants, berry bushes and shrubs from the strip of woods on his property. They will go along the length of my beach cave, where there is mostly shade. I’ll post again on Newsday Tuesday. Phall Photo Friday is a weekly feature here. Phall= P(atti) Hall. Categories: Phall Photos | Tags: family, Friends, gardening, photographs, travel | Permalink. Thank you, Marilyn. I will. You gypsy cave women know how to take good photographs. I hope you have a great weekend away and a nice visit with all the family. Thank you, David! It was a very good weekend, but I traveled over 500 miles and am pretty beat. Staying close to home for awhile. You keep up in intense pace, Patti. I’m a hermit by comparison. I love the wild bleeding hearts. It has been a crazy pace lately, Elaine, but it is the only way I can see Sara, Jon and the little grands. Should be calmer for the rest of June and all of July. The little ones are out of school, so they will be coming over to stay at the beach with grani. I’ll have my “visitors welcome” sign out, but staying close to the garden and cave and beach. Thanks for the visit and the compliment, Curt. They seem to be all done blooming in the wild, but mine are giving quite a show still. I wish I could have found my white ones when I was transplanting from my old garden. Yes, I’m staying out of mischief 🙂 At least, I’m trying to! Will give him your greeting when we talk again. We had a great weekend and, yep, got some photos to share soon. Thanks for all your sharing, commenting and liking. 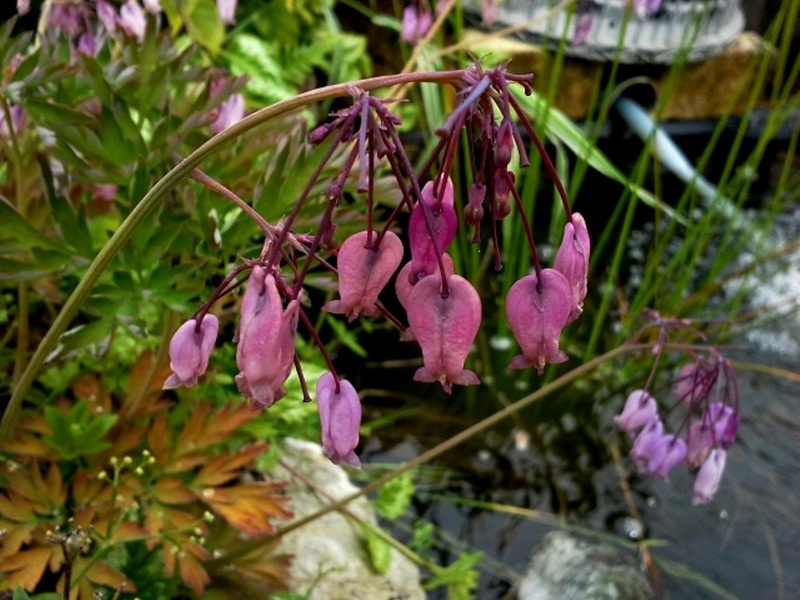 I associate bleeding hearts with the fondest memories of my Grandma Longenecker. Hers were a bright pink. The sight and smell takes me instantly back in time.